On paper the trio dubbed “The Professionals” (Gus Hansen, Viktor “Isildu1” Blom and Tom “durrrr” Dwan) appeared to have the edge over their opponents when it came to heads-up poker. However, after anteing-up $50,000 apiece inside London’s Victoria Casino yesterday, it was Team PokerStars (Daniel Negreanu, Bertrand Grospellier and Isaac Haxton) who emerged victorious. Each match was played on Full Tilt across three tables and when things kicked off it was Grospellier who made light work of Blom. Sweeping the opening battle, Grospellier won the first two tables before making top pair with A-K on a 5c 5d Ks flop. Fortunately for Grospellier Blom had also caught a piece of the board with K-10 and after the turn and river failed to alter the hand, it was the Frenchman who put Team PokerStars in the lead. Next to take to the felt were Isaac Haxton and Tom Dwan. In a clash of styles, it was Haxton who took an early lead after just 23 hands. Dwan managed to level the match after winning Table 2, before a cooler on Table 3 settled the match. Having committed all his chips pre-flop with Ac-Jc, Dwan was unlucky to find Haxton with pocket aces. A fruitless board for Dwan handed Haxton the match and his team a 2-0 lead. With only his team’s pride left to play for, Gus Hansen did his best to beat his fellow team captain. However, he got off to a disastrous start when he lost the first game, before his pocket jacks ran into Negreanu’s pocket kings. As if to add insult to injury, the final hand saw Negreanu force Hansen to call all-in with Js-9d. 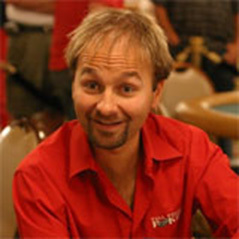 Comfortably ahead with Ac-Kc, Negreanu sealed the match when the board furnished him with the nut flush. With that the exhibition was over but not before Gus took time to call for a rematch.